The new album is done! Howard mastered the album’s seven tracks; after some final adjustments last week, it is perfect and ready and I sent it in. The LP plant has the audio master and the album jacket artwork. The company printing the deluxe art cards received the pdfs. And I’ve turned in the artwork to the CD manufacturing plant. Everything is moving along, though I think we’re a bit behind schedule for an August release, unless the LP pressing plant is really speedy. I think September seems more realistic for getting everything in the mail. I wrote an update at Kickstarter about the mastering earlier this week. For the last year I’ve been meaning to find time to put together this video of the track “Sometimes, Sunshine” from Revue Noir’s 2008 album ANTHLOGY ARCHIVE. 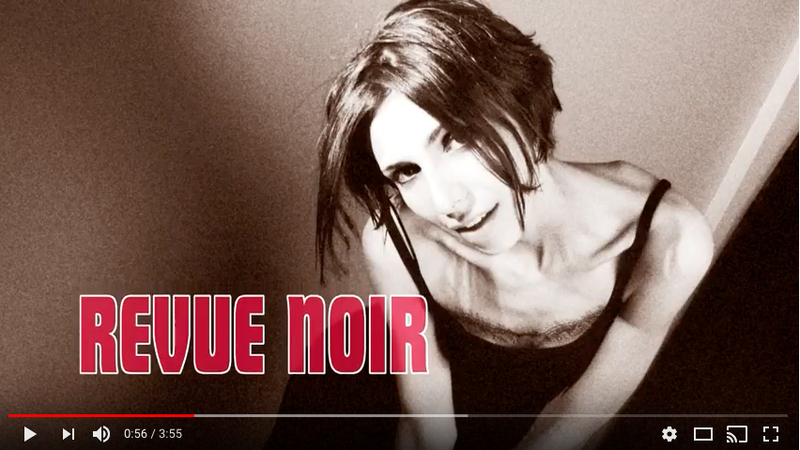 If you don’t know Revue Noir, it was my post-Halo Star collaboration with Nicki Jaine. We played eight shows between 2004-2009 and worked on a bit of original music. It’s pretty much part of the Black Tape For A Blue Girl timeline in my mind, as Nicki sang with BlackTape before & after, and we performed Nicki-solo & BlackTape material at those shows. 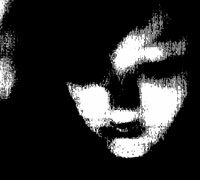 The reason I wanted to get this video made is there’s a youTube Dark Cabaret collection video that includes “Sometimes, Sunshine.” It has over 3.5 million plays, but we receive only 1/24th of a pittance for every play. A friend suggested uploading a video with nearly the same title as that video. That’s what I did. My video includes unseen 2005 photos I shot of Nicki for the album cover session, and a bit of video of Nicki from a show at Dances of Vice. Give it a look. I like it! Nicki is still one of my best friends, we talk often. She’s not involved or interested in the music business anymore (it stressed her out). She’s doing great, otherwise! Did you know that I play piano on this 2005 Steve Roach track, In The Eye Of Noche? There are multiple sides to BlackTape’s music. On the albums I integrate the diverse styles flowing from ethereal to ambient to song-like pieces. Sometimes you’re in the mood for the songs, so I created a playlist at Spotify with tracks from this side of the band. I plan to create more playlists. One I’ve been wanting to hear for 15+ years is “All the instrumental tracks with Vicki.” In the old days, I used to thing about these things and then shoot the idea down. “Do I really want to invest in a CD ‘overview’ that features instrumental tracks?” I know Eric would love that album, but would it sell enough at stores to make a good investment? Now I don’t have to worry. I can put that playlist up on Spotify for everyone to enjoy, without having a lot of CDs sitting around that I have to sell. Good deal! No, this isn’t a new art piece I’m working on. This is a photo I send to the pressing plant that screwed up the new pressing of Remnants vinyl. 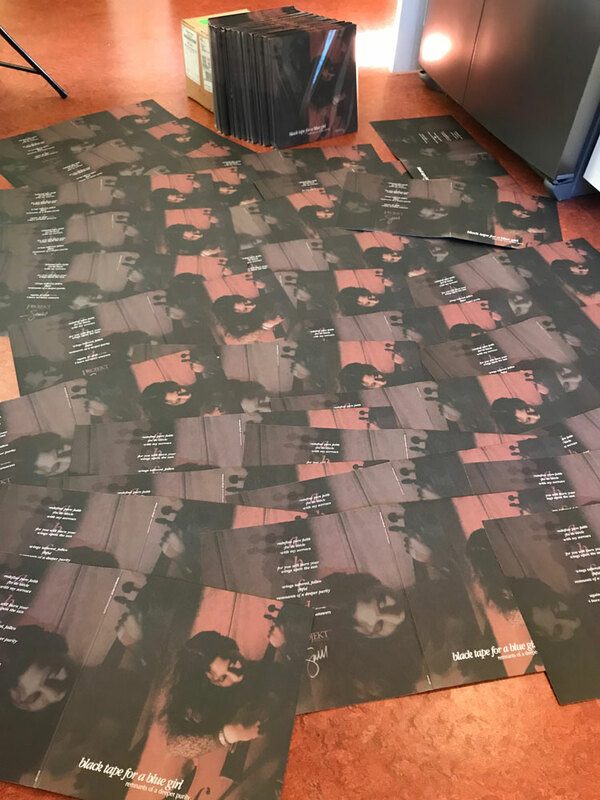 What happened is they shipped me a new batch of 150 copies of the LP and all the jackets were split open. This is not a gatefold release, this is the single-pocket vinyl jacket split and spread out on my kitchen floor. Grrrrrr. The vinyl looks and sounds great, it was just the jackets. There always seems to be a problem with American vinyl plants. I had to complain and argue, and go nuclear. When I refuted the credit card charge they suddenly became cooperative and offered me a refund of enough money to reprint the cover at a different plant. That will be at Precision the Canadian vendor I am working with on the To Touch The Milky Way album. The recent Kickstarter included a vinyl option with Milky Way, These fleeting moments and Remnants of a deeper purity. For those of you who didn’t get in on that pledge, I am planning a special package in a few months. I will reprint the 90s Remnants T-shirt, offering it in a combo pack with the vinyl (and perhaps a tote bag)! Stay tuned for that. Something else to stay tuned for: I’m finishing a digital-only release of tracks that Nicki Jaine sang with Black Tape For A Blue Girl at 2010’s Steampunk World’s Fair. Martin Bowes (Attrition) mastered it; I’m sending it to my digital distributor Monday. I haven’t posted music or artwork from the new album, so it can be a wonderful fresh experience when my backers open their packages. Dani and Michael provide wonderful vocals. Mercy and I created evocative imagery for the cover. It’s going to be fantastic! Thanks for your support and interest in Black Tape For A Blue Girl. Here’s where you can follow me for regular updates and pictures from my life. Twitter & Instagram.